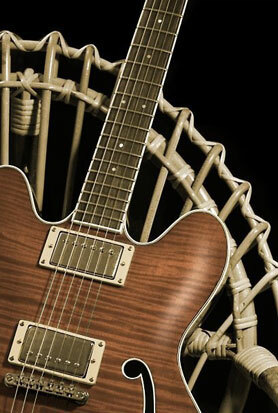 Instruments with a central block construction are universal guitars, used by jazz or electric guitar players. It is a feedback resistant guitar, with effect cooperation ability, nevertheless useful for traditional jazz playing. Acoustic characteristics mostly depends on central block material. Balsa - recently favoured material for its amazing acoustic coloured sound with a lot of higher harmonics and very long sustain. However these instruments aren´t suitable for band onstage playing. They are great for chamber projects or for solo players. Gabon, Mahogany Khaya - very similar charcteristics to balsa. Better usage in the band. Mahogany Sapeli - produces full strong sound with adequate sustain. Sound is aggressive, right for rock music. Prochazka Custom Guitars strongly recommend Maple and Alder - two different materials which are able to satisfy most of sound requirements. Maple - full strong sound, less of colors, shorter sustain, great dynamics. These instruments are favoured by many jazz guitar players for its sound characteristics while tone control is used. Maple block guitars are the best solution instruments for funky and fusion. Alder - coloured sound, adequate sustain and higher harmonics loads. Instruments with Alder block are favoured by guitar players who prefer universal jazz rock guitar.